(Marvel Zombies Supreme#1 (fb)) - Dr. Mortimer Dauoi of Project: PEGASUS received the DNA codes generated as hard light by Dr. Spectrum of the Squadron Supreme of Earth-712. Dauoi grafted the DNA to medical cadavers and used Zeta rays (negatively charged energy) to reanimate the corpses, although the rays were amplified by the Zero energy from the discorporeal Jack of Hearts. Probably because of the refractive nature of Dr. Spectrum's Power Prism, the cadavers revived instead in a zombie-like and human-hungry state, soon overrunning the complex. These zombies had the appearance, powers and emotions of the original Squadron Supreme, but were overwhelmed by insatiable hunger. They evidently found costumes in the complex and took on the names of those whom they were cloned after. Nuke went after the nuclear waste facility at the complex. (Marvel Zombies Supreme#1) - Battlestar and the Guardsman Alpha Team (Doc, Jill Harper, Hoss, Mainframe, Soapbox, Two-Ton) were called to investigate. The Whizzer clone spied them enter the complex. The Tom Thumb zombie attacked the soldiers but was destroyed. The Guardsmen found the surviving scientists, but the Nighthawk zombie clone arrived, and quickly bit and infected many of the scientists. The rest of the Squadron Supreme zombies arrived and a short fight ensued, but the humans escaped despite several casualties. Later, the Hyperion clone left behind the Nighthawk and the worried Power Princess zombies and dived into the magma pool beneath Project: PEGASUS to find new food sources. He emerged in Kansas. (Marvel Zombies Supreme#2) - The Whizzer, Shape and Blue Eagle zombie clones found the humans and attacked. The Blue Eagle clone was sliced in half by Battlestar but continued driven by hunger. Power Princess caught up with them but Harper and Hoss barricaded themselves in the Zero energy chamber where Jack of Hearts rematerialized. Meanwhile, the Hyperion zombie had emerged in Kansas, killing many before being confronted by the state's Initiative team, the Harvesters. He quickly killed all except one before falling to tainted meat he had eaten. (Marvel Zombies Supreme#3) - The remaining Squadron Supreme clones at the complex tried to break into the chamber. The Whizzer clone caught the Guardsman Soapbox, but was knocked out by an energy blast. 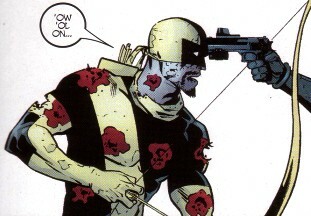 The zombie Golden Archer tied his teeth to an arrow that he fired at Hoss, which began to slowly infect him with the zombie plague. Elsewhere, in West Vermont, Nuke emerged at a nuclear power plant and spread the zombie plague throughout the town, but everyone was incinerated by a nuclear bomb strike ordered by the mayor, Tom Aldrin. (Marvel Zombies Supreme#4) - The Nighthawk, Lady Lark, Shape, Power Princess and Golden Archer zombie clones pursued Harper, Hoss and Jack of Hearts. 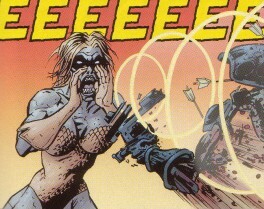 Hoss remained human enough to destroy the Golden Archer clone but his body was destroyed by the zombie Lady Lark. Elsewhere, Battlestar eliminated the Blue Eagle zombie while Soapbox dismembered the Amphibian clone using more energy blasts. The Lady Lark zombie mourned the loss of Golden Archer while the Power Princess zombie was knocked back by the booby-trapped head of Hoss. Shape cornered Harper and Jack of Hearts, swallowing Harper whole. (Marvel Zombies Supreme#5) - In the upper section of Project: PEGASUS, the zombie clones of Power Princess and Whizzer spoke of having once been heroes, while the Nighthawk and Lady Lark zombies instead embraced the hunger, who then led the four to the exit. Meanwhile, Jack of Hearts rescued Harper, who recognized that his Zero energy blasts could destroy the zombies and Shape was eliminated. The two then went to the exit where the four remaining Squadron Supreme zombies were trying to leave amongst other zombies led by the mutated Dr. Dauoi, but they were held back by the surviving members of Guardsman Alpha Team and Battlestar. Nighthawk managed to bite Harper just before Jack of Hearts vanquished all the zombies with a Zero energy burst. Comments: Created by Frank Marraffino (writer), Fernando Blanco (pencils) and Jason Paz (inks). Anyone else wonder if there was a zombie clone of Dr. Spectrum...? 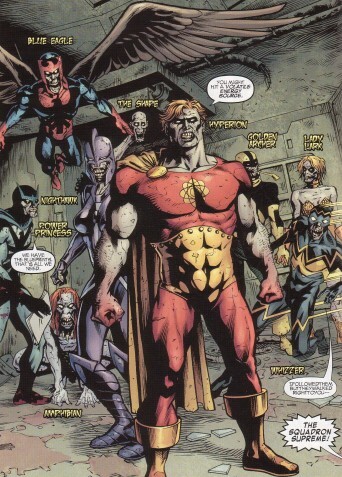 Although the names of the real members of the Squadron Supreme may have differed slightly, these are the names that the zombies adopted (see main image). See the Handbooks for expanded info on the powers of the originals (who are close duplicates of DC's JLA). As far as I know/recall, the Squadron Supreme members who stayed at PEGASUS were Dr. Spectrum, Haywire, Hyperion, Moonglow (Arcanna), Power Princess, Shape, Skylark, & Whizzer. So...where did they get the DNA for Amphibian, Blue Eagle, Golden Archer, Nighthawk, Nuke & Tom Thumb? --The latter five died in the Squadron Supreme “maxi-series,” and Amphibian quit and didn’t get back together with them until much later, in New World Order. Possibly just an error in the story. Obviously PEGASUS could have traveled to Earth-712 to get samples. The flashback in the story shows only Spectrum, Whizzer, Hyperion, Shape, Power Princess and Lady Lark (Skylark) at Project: PEGASUS. The DNA was not taken directly from the SqSup, but rather from hard light constructs for all that were generated by Dr. Spectrum. So it's more of an issue of how much contact Spectrum had with the other originals that were later "cloned" by Dauoi. (Marvel Zombies Supreme#1 (fb)) - Amphibian's DNA was copied and grafted onto a human corpse by Dr. Dauoi at Project: PEGASUS. The resulting zombie clone escaped with the other Squadron Supreme zombie clones and helped kill/convert many of the scientists. (Marvel Zombies Supreme#1) - Battlestar and the Guardsman Alpha Team assembled to investigate the problem found surviving scientists, but the Nighthawk zombie clone arrived, and quickly bit and infected many of the scientists. The rest of the Squadron Supreme zombies arrived and a short fight ensued, but the humans escaped despite several casualties. (Marvel Zombies Supreme#3) - Under the Nighthawk zombie's instruction, the Amphibian clone hopped ahead to find the exit. (Marvel Zombies Supreme#4) - The zombie Amphibian attacked Soapbox, but was instead dismembered by the soldier's particle beam. (Marvel Zombies Supreme#5 - BTS) - The cloned Amphibian's zombie body was destroyed by Jack of Hearts' Zero energy burst. (Marvel Zombies Supreme#1 (fb)) - Blue Eagle's DNA was copied and grafted onto a human corpse by Dr. Dauoi at Project: PEGASUS. The resulting zombie clone escaped with the other Squadron Supreme zombie clones and helped kill/convert many of the scientists. (Marvel Zombies Supreme#1) - Battlestar and the Guardsman Alpha Team assembled to investigate the problem found the surviving scientists, but the Nighthawk zombie clone led the zombie Squadron Supreme against the humans. (Marvel Zombies Supreme#2) - The Blue Eagle clone attacked the soldiers but Battlestar sliced the zombie in half with his shield. He nevertheless recovered and began eating one of the surviving scientists. (Marvel Zombies Supreme#3) - Smelling human flesh, the Nighthawk zombie ordered the Blue Eagle clone to fly up into the elevator shaft. 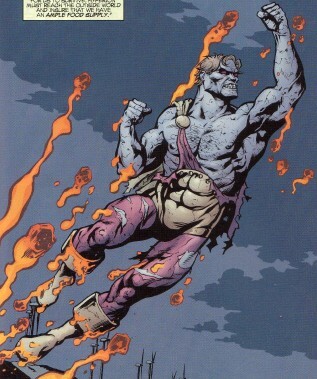 (Marvel Zombies Supreme#4) - The Blue Eagle zombie attacked Battlestar climbing up the shaft's cable, but was instead ripped apart by the hero. 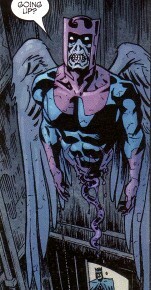 (Marvel Zombies Supreme#5 - BTS) - The cloned Blue Eagle's zombie body was destroyed by Jack of Hearts' Zero energy burst. (Marvel Zombies Supreme#1 (fb)) - Golden Archer's DNA was copied and grafted onto a human corpse by Dr. Dauoi at Project: PEGASUS. 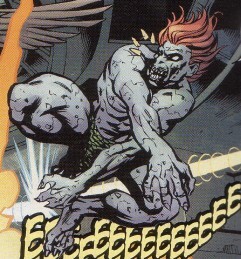 The resulting zombie clone escaped with the other Squadron Supreme zombie clones and helped kill/convert many of the scientists. (Marvel Zombies Supreme#3) - Chided by the Blue Eagle clone for not pulling his weight, the Golden Archer came up with the plan to use his teeth mounted on arrowheads to infect the remaining humans. He fired one at Hoss once they breached the barrier, which slowly began to infect Hoss with the zombie plague. (Marvel Zombies Supreme#4) - The Nighthawk, Power Princess, Lady Lark and Golden Archer clones advanced on Hoss. The zombie Golden Archer fired more arrows at Hoss who fired back just as many bullets until Hoss was able to get close enough to blow the zombie's head off. (Marvel Zombies Supreme#1 (fb)) - Hyperion's DNA was copied and grafted onto a human corpse by Dr. Dauoi at Project: PEGASUS. The resulting zombie clone escaped with the other Squadron Supreme zombie clones and helped kill/convert many of the scientists there. (Marvel Zombies Supreme#1) - Battlestar and Guardsman Alpha Team were confronted by Hyperion and the other zombie Squadron Supreme members. 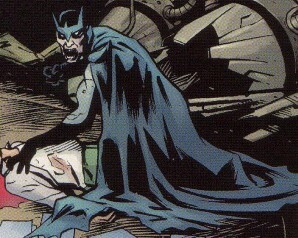 He tore apart Two-Ton when he fired at him, but was severely weakened by Argonite thrown at him, an element that could harm him, but this was quickly removed by the Whizzer zombie. Soon after, the Hyperion zombie dived into the magma pool in the installation's basement in an effort to escape and ensure an ample food supply for them. 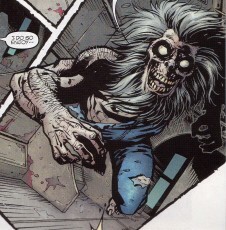 (Marvel Zombies Supreme#2) - The Hyperion zombie emerged in the Kansas countryside, killing manyacross two counties. Smelling the tainted cattle on a Roxxon rig, he briefly overcame his ravenous hunger and recovered his heroic side, demolishing the truck and devouring the infected cows to eliminate them, but was confronted by the state's Initiative team, the Harvesters. He quickly ploughed through them, killing all but one before succumbing to the toxins in the beef. (Marvel Zombies Supreme#1 (fb)) - Lady Lark's DNA was copied and grafted onto a human corpse by Dr. Dauoi at Project: PEGASUS. The resulting zombie clone escaped with the other Squadron Supreme zombie clones and helped kill/convert many of the scientists. (Marvel Zombies Supreme#3) - The zombie Lady Lark waited until the Princess Power clone broke down the door to reach Harper and Hoss. (Marvel Zombies Supreme#4) - The Nighthawk, Power Princess, Lady Lark and Golden Archer clones advanced on Hoss, but she instead saw her beloved destroyed by the soldier. She ripped apart Hoss' body using her sonic scream. (Marvel Zombies Supreme#5) - The zombie Lady Lark mourned Golden Archer and chose to follow the Nighthawk's clone to give in to their hunger and escape the complex to feed. At the escape she found Dr. Dauoi and other zombies, and tried to fight past Battlestar and Guardsman Alpha Team, but was destroyed by Jack of Heart's Zero energy blast. (Marvel Zombies Supreme#1 (fb)) - Nighthawk's DNA was copied and grafted onto a human corpse by Dr. Dauoi at Project: PEGASUS. The resulting zombie clone escaped with the other Squadron Supreme zombie clones and helped kill/convert many of the scientists. (Marvel Zombies Supreme#1) - Battlestar and the Guardsman Alpha Team assembled to investigate the problem found the surviving scientists, but the Nighthawk zombie clone appeared from the shadows, biting and turning many of the scientists. The rest of the Squadron Supreme zombies arrived and a short fight ensued, but the humans escaped despite several casualties. With the Power Princess zombie, he later farewelled the zombie Hyperion when he left via the magma pool. (Marvel Zombies Supreme#3) - The Nighthawk zombie assumed leadership and directed the others what to do to hunt down the soldiers. (Marvel Zombies Supreme#4) - The Nighthawk, Power Princess, Lady Lark and Golden Archer zombie clones advanced on Hoss while Harper and Jack of Hearts escaped. He looked over the installation's plans while the zombie Power Princess unsuccessfully tried to breach the door. (Marvel Zombies Supreme#5) - The zombie Nighthawk dismissed the Power Princess clone's call to return to being heroes and instead gave in to the unrelenting hunger, leading them to the exit to escape the complex and feed. At the escape he found Dr. Dauoi and other zombies, and tried to fight past Battlestar and Guardsman Alpha Team. He managed to bite Harper before being destroyed by Jack of Heart's Zero energy blast. Jack of Hearts then cured Harper from the zombie infection. (Marvel Zombies Supreme#1 (fb)) - Nuke's DNA was copied and grafted onto a human corpse by Dr. Dauoi at Project: PEGASUS. The resulting zombie clone escaped with the other Squadron Supreme zombie clones and helped kill/convert many of the scientists. However, his tastes seemed different and he went instead to the installation's radioactive waster chute after killing the nuclear disposal team. (Marvel Zombies Supreme#3) - He arrived at a nuclear power plant in West Vermont, damaging the reactor and spreading radioactivity, but also turning the employees into zombies. He then went after the plant manager in the nearby town. The mayor, Tom Aldrin, shot at him with no effect except to anger the zombified clone. He infected many of the townspeople, spreading the zombie plague throughout the town, but was badly injured by a fire truck trying to stop the zombies. Aldrin had informed the authorities of the plague and a nuclear strike blasted the town, destroying everyone there, including Nuke. (Marvel Zombies Supreme#1 (fb)) - Power Princess' DNA was copied and grafted onto a human corpse by Dr. Dauoi at Project: PEGASUS. The resulting zombie clone escaped with the other Squadron Supreme zombie clones and helped kill/convert many of the scientists. (Marvel Zombies Supreme#1) - Battlestar and the Guardsman Alpha Team assembled to investigate the problem found the surviving scientists, but the Nighthawk zombie clone led the rest of the Squadron Supreme zombies into the room and a short fight ensued, but the humans escaped despite several casualties. With the Power Princess zombie concerned for her love, she later farewelled the zombie Hyperion when he left via the magma pool. (Marvel Zombies Supreme#2) - The Power Princess zombie pursued the soldiers but was locked out from where they had run to. (Marvel Zombies Supreme#3) - The zombie Princess finally managed to breach the barrier to find Harper and Hoss. (Marvel Zombies Supreme#4) - The Nighthawk, Power Princess, Lady Lark and Golden Archer zombie clones advanced on Hoss while Harper and Jack of Hearts escaped. She unsuccessfully tried to breach the door. (Marvel Zombies Supreme#5) - The zombie Power Princess recalled being a hero and that she was that no longer but still followed the Nighthawk's clone to escape the complex and feed. At the escape she found Dr. Dauoi and other zombies, and tried to fight past Battlestar and Guardsman Alpha Team, but was destroyed by Jack of Heart's Zero energy blast. (Marvel Zombies Supreme#1 (fb)) - Shape's DNA was copied and grafted onto a human corpse by Dr. Dauoi at Project: PEGASUS. The resulting zombie clone escaped with the other Squadron Supreme zombie clones and helped kill/convert many of the scientists. (Marvel Zombies Supreme#1) - Battlestar and the Guardsman Alpha Team assembled to investigate the problem found the surviving scientists, but the Nighthawk zombie clone led the rest of the Squadron Supreme zombies into the room and a short fight ensued, but the humans escaped despite several casualties. 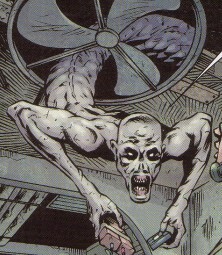 (Marvel Zombies Supreme#2) - The Shape zombie pursued the soldiers through the air ducts and dodged bullets with his malleable form. (Marvel Zombies Supreme#3) - The zombie Shape waited until the Princess Power clone broke down the door to reach Harper and Hoss. (Marvel Zombies Supreme#4) - The Shape zombie followed the Nighthawk, Power Princess, Lady Lark and Golden Archer clones in pursuing Hoss, Harper and Jack of Hearts. Shape separated from the other and used the ducts to find Harper and Jack of Hearts. He swallowed Harper whole and advanced on Jack of Hearts. (Marvel Zombies Supreme#5) - Jack of Hearts ripped out the undigested Harper from inside the Shape clone, who had been monstrously engorged from eating so many people. Harper and Jack of Hearts then destroyed the zombie Shape. (Marvel Zombies Supreme#1 (fb)) - Tom Thumb's DNA was copied and grafted onto a human corpse by Dr. Dauoi. The resulting zombie clone escaped with the other Squadron Supreme zombie clones and helped kill/convert many of the scientists there. 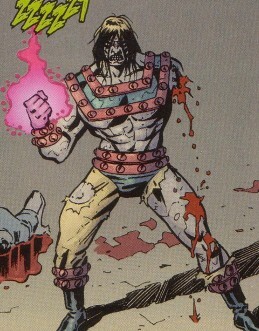 (Marvel Zombies Supreme#1) - The Tom Thumb zombie was the first zombie Squad member encountered by Battlestar and the Guardsman Alpha Team. When he ran to attack the Guardsman team, his head was blown apart by Hoss. (Marvel Zombies Supreme#1 (fb)) - Whizzer's DNA was copied and grafted onto a human corpse by Dr. Dauoi at Project: PEGASUS. The resulting zombie clone escaped with the other Squadron Supreme zombie clones and helped kill/convert many of the scientists. (Marvel Zombies Supreme#1) - The Whizzer clone spied Battlestar and Guardsman Alpha Team enter the complex. 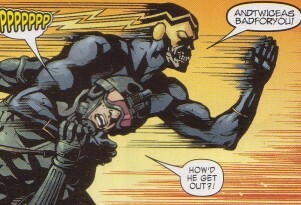 The Guardsmen found surviving scientists, but the Nighthawk zombie clone led the rest of the Squadron Supreme zombies into the room of survivors and a short fight ensued, but the humans escaped despite several casualties. He got rid of the Argonite that was severely weakening the zombie Hyperion. (Marvel Zombies Supreme#2) - The zombie Whizzer ran in and grabbed Guardsman Soapbox then ran off with him. (Marvel Zombies Supreme#3) - The Whizzer clone kept running with Soapbox, who freed himself by injuring the zombie with a particle beam. (Marvel Zombies Supreme#5) - Found by the other zombie Squad member, the zombie Whizzer recognized that they had lost being heroes but still followed the Nighthawk's clone to escape the complex and feed. At the escape he found Dr. Dauoi and other zombies, and tried to fight past Battlestar and Guardsman Alpha Team, his fingers broken by the android Mainframe, and was destroyed by Jack of Heart's Zero energy burst. Marvel Zombies Supreme#3-5 (June-August, 2011) - Frank Marraffino (writer), Fernando Blanco (pencils & inks), Mark Paniccia (editor).